Find the best Delonghi deals for a new kitchen kettle, toaster and coffee machine. DēLonghi is a stylish kitchen appliance manufacturer. Modern appliances for the modern home. Find cheap 4-slice toasters and other devices such as oil-filled radiators. You can find the latest deals, discounts and voucher codes as shared by our community of bargain hunters. Discounts from Amazon, eBay, Argos, Robert Dyas and more. Wake up to a beautiful morning with budget-friendly Delonghi deals! DeLonghi coffee makers can be found anywhere in the world and they are used by many reputable coffee shops in the world. DeLonghi coffee machines make delicious brewed coffee. With this coffee machine, you can make delicious brewed coffee anytime you want. In this modern world where everyone is in a hurry. Having a machine that can make quality coffee fast and easy is a must. For more than 100 years, the DeLonghi Company is regarded as one of the best providers of home appliances in the world. They are best known for their coffee makers. They also make quality blenders, toasters, irons, juicers, ovens, and more. They make the best innovations when it comes to kitchen and home appliances. They use the advancement of technology in their products and they find ways to automate everything. They provide the best solutions when it comes to making coffee like having a timer so that you can enjoy your coffee in the morning instantly. You can even put whole coffee beans in your coffee maker and have perfectly brewed coffee without having to grind your beans. These are some of the great features that DeLonghi coffee makers have in common. Where Can I Find Cheap DeLonghi Deals Online? 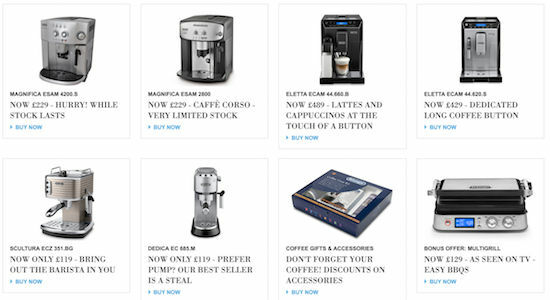 When it comes to Delonghi coffee machines, we can provide you with the best deals and the latest discounts and voucher codes from your favourite online UK retailers. You can also buy a Delonghi kettle and toaster for reasonable costs. Here at Latest Deals, our community of bargain hunters regularly verify and post the best Delonghi home and kitchen appliances sale and price drops for you to take advantage. If you have a quality Delonghi machine, you can enjoy delicious espressos, cappuccinos, and lattes anytime. There are also other items such as Delonghi microwaves and toasters that you can buy from major UK retailers at very low prices. All you have to do is use voucher codes you can find here and you can save some money on the side. Having a delicious cup of coffee is great to start your day. 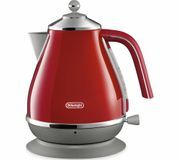 If you are looking for an affordable Delonghi Kettle, you can get it at Half Price when you buy at Argos. 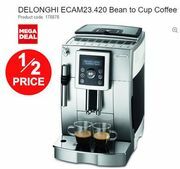 You can surely get great bargains when you purchase Delonghi products. You can even save as much as £250 for selected items. It is also good if you purchase a Delonghi Kettle to keep your coffee warm for a long time. Get it at Debenhams and save as much as £44. Ebuyer is giving away 2 Free Stylish porcelain Coffee Cups together with 2 boxes of Coffee grounds when you buy a Delonghi coffee machine from them. Now that is a great deal. If that is not enough. You can save as much as £150 when you buy a Bean to Cup Coffee Machine at Argos. Buy a Delonghi coffee maker today and enjoy a fresh cup of quality brewed coffee. Get a DeLonghi Espresso Coffee Machine for your home or office. Save as much as £50 when you buy at eBay. They are also DeLonghi Vintage Kettles at AO where they are selling them at £15 off. Having bread with your coffee is great anytime of the day. 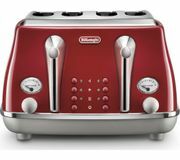 Purchase a DeLonghi Bread Toaster at Argos and save £30. They also have coffee makers at Currys PC World where they are giving their customers a £45 discount. The Delonghi "Bean to Brew" System – This procedure makes espresso brewing easier and faster. You can brew fresh whole coffee beans at the comfort of your own home or office. Built-in coffee bean grinder - With this machine, you do not have to buy expensive pre-ground coffee beans. It only grounds the beans that are going to be used for a single brew cycle. Heating Plate - There is a heating plate that keeps your espresso warm for you to enjoy. Keeping coffee at the perfect temperature so that you will not have cold coffee when you are ready to drink it. Automatic Timer - It has an automatic timer so that you will have your coffee ready when you wake up in the morning. Large Capacity – It has a large water reservoir that is large enough for two to three days of personal coffee consumption. You do not have to refill it with water too often. Style – Delonghi coffee machines have a modern look and most of them have a sleek stainless steel design that will look good on your countertop giving it a futuristic vibe. Money Saver – Purchasing gourmet coffee is very expensive. But with a Delonghi coffee machine, you can drink as many delicious coffees as you want. You do not have to spend a fortune just to have a quality brewed coffee. DeLonghi EC702 Espresso Maker – It allows you to make coffee like a professional barista. It is perfect for making espressos, double espressos, lattes and cappuccinos. 8DeLonghi Bar 32 Espresso & Cappucino Machine – It is inexpensive and you can use coffee grounds or pods. It delivers 15-bars of pressure and it has a removable water reservoir. 6Delonghi EC680M DEDICA Espresso Maker – This classy stainless-steel designed coffee maker makes great espresso cappuccinos, espressos, and lattes. It has a built-in cup warmer. 5DeLonghi EDG455TEX1 Nescafe Dolce Gusto Genio Espresso Maker – This machine does not require any preheating. You can make coffee with this machine fast and easy. 4DeLonghi ESAM3300 Magnifica Super-Automatic Espresso Maker - It has a conical burr grinder that is great in grinding whole coffee beans. It also has an auto shut-off function. It is also very easy to clean. 3DeLonghi Silver Lattissima Plus – It looks cool since it has Illuminated controls. You can also experiment making various kinds of drinks with this coffee machine.